Copenhagen, Denmark’s magnificent Østre Gasværk Teater in the city’s Østerbro district is housed in a former gas holder once part of the old Eastern Gasworks complex, built in 1878 and designed by Martin Nyrop, also the architect of Copenhagen City Hall. 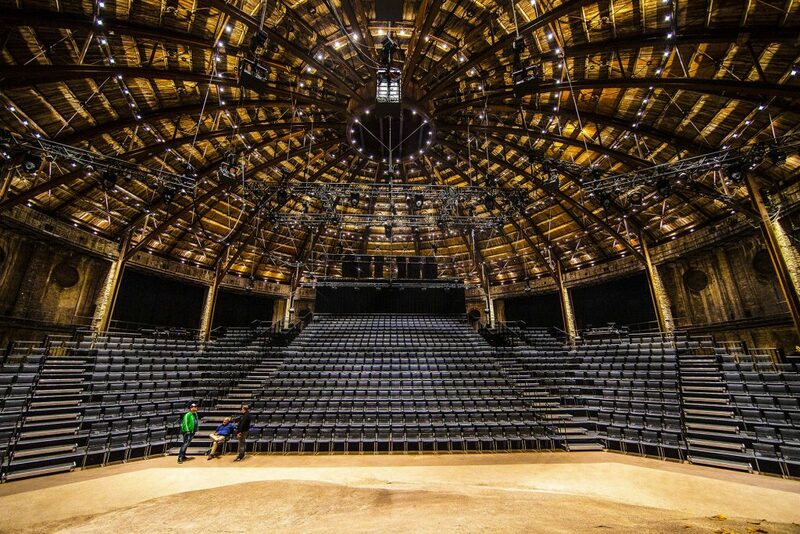 The venue has functioned as a performance space since the 1970s, however in the last year an extensive technical refit and major rigging upgrade has involved the installation of a completely new free-standing steel grid internal structure, together with a Kinesys automation system – featuring the latest Kinesys Apex chain hoists and DigiHoist control. The theatre started off presenting alternative dance works and hosting concerts and fashion shows as well as gripping dramas. Over the years the production requirements have become steadily more complex and ambitious. In 2016, the Østre Gasværk Teater merged with another major cultural institution, the Republique Theatre, and Emmet Feigenberg was appointed artistic director, moving everything into a new era. With this came – finally – the realisation that the old flying facilities were no longer realistically serviceable to stage modern productions, so with the writing on the wall, outgoing artistic director Pia Jette Hansen, the board of the building’s management company and previous production manager Frank Beck started a campaign to secure funding to make some radical changes, explained Østre Gasværk’s head of lighting Brian Njie and head of stage Jacob Frederiksen. As a listed / protected building and a much-loved landmark of Copenhagen’s industrial heritage, designing a workable solution for rigging inside Østre Gasværk was also a brainteaser! None of its elegant 45 metre diameter circular circumference wall area could have anything attached to – or even touching- it! The genius idea of the new 160 tonne internal steel dome – based on 16 vertical pillars and industrial grade curved roof struts, all in perfect harmony with the geometry of the space, fitting with just millimetres to spare – was a collaboration between Frank Beck, architects C&W-arkitekter & VTC / SHM, structural specialists VITA engineers and engineering consultants Balslev. The whole Østre Gasværk technical crew – including Brian, Jacob and everyone utilising the theatre on a daily basis – had input on this solution and how it would work. The sub-structure was one thing, the goal was then to utilise the fantastic new 60 tonne flying capacity offered by the grid … to provide imaginative, flexible and efficient solutions for all productions. It was Rasmus Schmidt from rigging and production company Drop who first suggested the power and adaptability of Kinesys. He often works in the space and consults on the more complex rigging missions. Brian, Jacob and former stage manager Mammad Aliabadian had all heard of the brand but had not used it hands-on. They visited Prolight+Sound Frankfurt in 2017 shortly after the launch of Apex and saw that and the full range of Kinesys products in action. They also checked these out thoroughly via Kinesys’ Danish distributor, Light Partner, with whom they already enjoyed a great working relationship as a lighting supplier, as well as meeting the Kinesys team from London in Frankfurt. He added that they also felt investing in Kinesys would offer a degree of future-proofing. The theatre’s grid installation started in early 2018. It was fabricated and constructed by HSM Industri A/S – and completed a month ago with the 855-capacity venue re-opening a few days later. The Kinesys kit includes an initial purchase of six half tonne Apex vari-speed hoists with controllers and three Kinesys fixed-speed DigiHoist controllers which are being used to run 32 x EXE-Rise hoists which are a mix of 150Kgs, 600Kgs and 800Kgs in capacity. All of these are moving a selection of trusses in the roof that facilitate multiple lighting, audio, video and scenery positions. The Apex hoists were selected for their high-end functionality like enhanced quietness – essential in a theatrical environment – zero speed hover, sub-millimetre accuracy and the ability to safely fly people that comes with EN61508-SIL3 and DIN56950 compliance. They are looking forward to using these for automating set pieces as well. With this set-up, the production kit can easily be rigged or maintained at ground level, then flown out for the show or for storage, and the days of working at heights from access towers and other plant above the auditorium and stage areas are over. At the essence of the flying requirements was having one intuitive and user-friendly control system to safely run all the Apex and EXE-Rise hoists. The six Apex hoists have their own drive units and a Kinesys Dimension pendant remote which is how they are currently being run. This and the DigiHoist system are linked via a Kinesys Mentor Series 4 which enables the units to have a common safety architecture. The intention is, in time, to run all the hoists via the Dimension pendant remote. The first productions are already benefitting from the new flying facilities and everyone is delighted with the additional scope and efficiency of the Kinesys system. “It’s quieter, safer, an order of magnitude more reliable and hugely more dynamic than before” stated Jacob. Being able to move the rig and equipment around using the automation and the new sub-structure – juxtaposed magnificently against the original steelwork and superstructure from the 1880s – is also making workflow tighter and tech periods more productive. 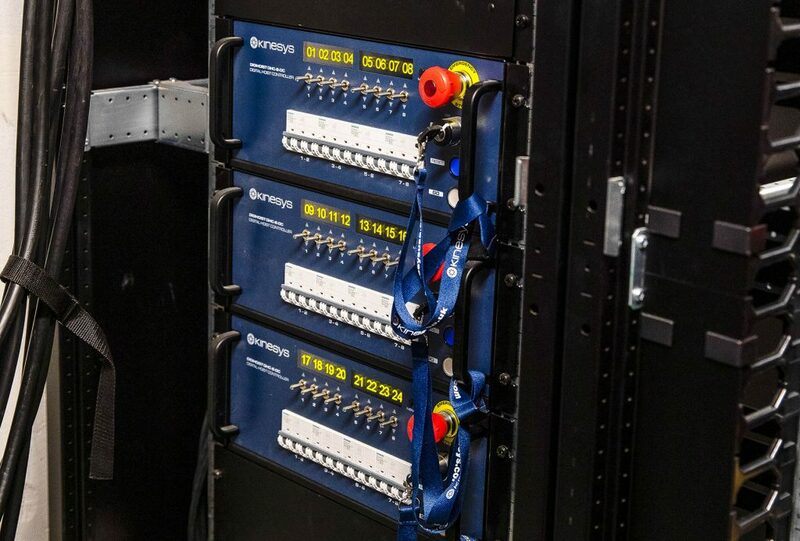 Official Kinesys training will be arranged soon to enable all the lighting, AV, audio and stage technicians working regularly in the venue to get the most of out of their new facilities.